A combination of German Supergrip all weather latex and half negative cut make this one of the best goalkeeper gloves on the market for 2017. 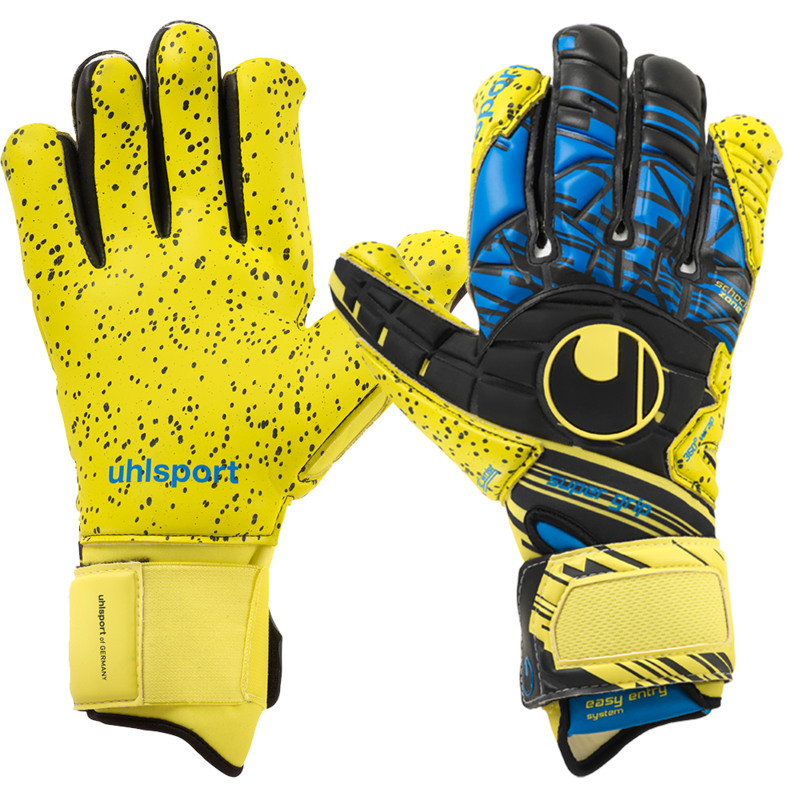 Uhlsport Eliminator Supergrip palm for high grip performance and perfect abrasion restistance. Best balance of grip and durability in the Uhlsport range and arguably all goalkeeper gloves. The black particles in the fluorescent yellow latex are the "High Grip Elements". The Supergrip foam is a simply the best gripping latex on the market right now. Comfortable textile for best breathability and wearing comfort with a 3D-embossed latex. The backhand also features a 3D-embossed SCHOCKZONE-element with high rebound foam for optimised punching performance and cushioning. The neoprene glove body gives the glove an almost custom fit. 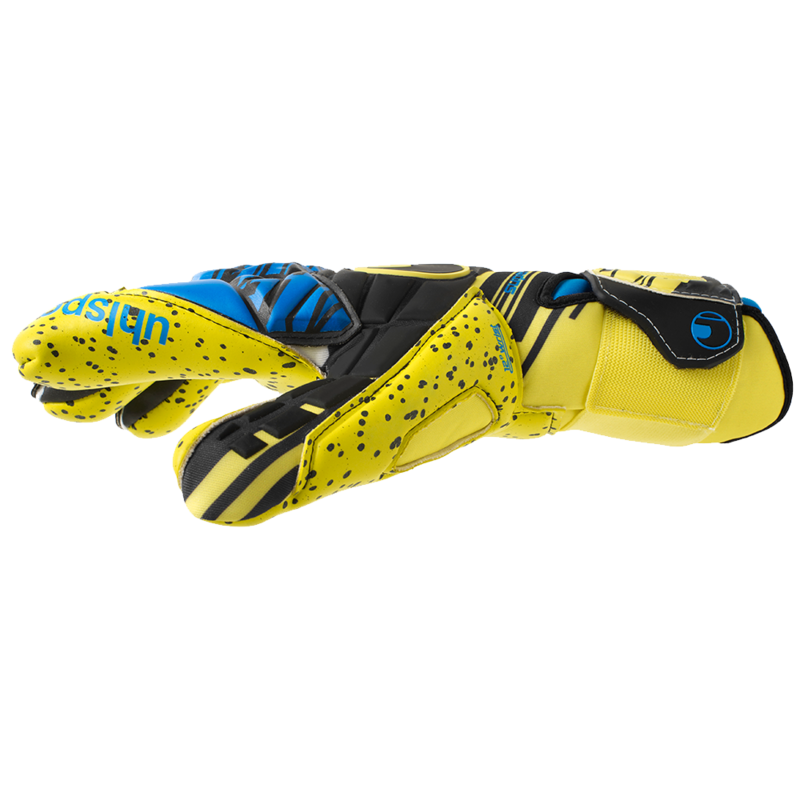 Uhlsport glove backhand is fluorescent yellow, griffin grey, and white. Half negative cut with 360 wrap and wrapped thumb for a tighter fit and secure feel. The middle and ring fingers feature a full negative cut, whilst the pinky and index finger have a half negative half roll cut to allow for a tight fit, but still allow the most latex to ball contact. Uhlsport goalie glove is ergonomically preshaped for best wearing characteristics and ball feel. The 12° angle on the wrist supports the ergonomical hand position for perfect catching performance. Very comfortable. Half wrap latex strap with stretch strap component for custom fit. The glove entry has a neoprene body, with Uhlsports "Easy Entry System" to make pulling the glove on and off a breeze. Supergrip all weather latex performs well in all conditions. Top of the range model in the Uhlsport goalkeeper glove range. This glove will be one of the best releases of 2017. I really love these gloves! They are very good when it comes to grip and punching out shots when coming fast. These gloves have no finger support so they are a stretch for my JV keeper, however, he likes the feel of them and that he can throw better with them. As his fingers become stronger and his technique better, he will likely gravitate to these gloves from his gloves with finger support. He is using these for some practices but not games.